New Delhi: Anna Hazare, who followed the crucial debate on Lokpal in Parliament on his iPad during his fast, has paid rich tributes to the gadget's creator Steve Jobs, saying his innovations have helped him in his fight for Jan Lokpal Bill. "Steve Jobs will always be remembered for his unparallelled contribution to the world of technology. 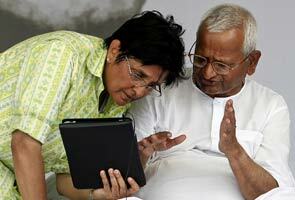 The news of his death is saddening," Hazare said in his latest blog posting. Jobs, the co-founder of Apple which developed the iPad, died in California on October six after fighting pancreatic cancer for years. Hazare remembered Jobs as one of those who "sculpted the history of technology by bringing about a revolutionary change" that brought the world together. "He enabled a line of direct inter-personal communication between people staying in different places at different levels. His contribution will be remembered forever. Jobs used his imagination and futuristic viewpoint as he worked on his research hence his revolutionary thoughts will always hold an important place in modern history," he said. Acknowledging that technology has been helpful in organising people to fight against injustice and corruption, he said Jobs' innovations have brought about a revolutionary change. "I have personally experienced this during my fight for Jan Lokpal Bill. Without any doubt, we will need it at every step of our life," he said. Hazare had on August 27, the 12th day of his fast in Ramlila Maidan demanding a strong Lokpal Bill, followed the crucial debate in Parliament over Lokpal Bill on his iPad. "Bahut achaa hai (it is very good)," the 74-year-old Gandhian had then remarked as he watched the proceedings in his makeshift room at Ramlila Maidan here.